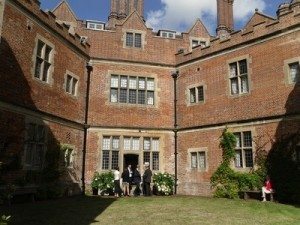 Myself and Hellen managed a bespoke event on Tuesday for a Wealth Management firm at Chilham Castle in Kent. The event was for 150 of their clients to have a private viewing of an art exhibition and an afternoon cream tea in the Castles gardens to provide some networking and to treat their clients to something special. After months of planning and preparation the event finally took place this week and was a great success. 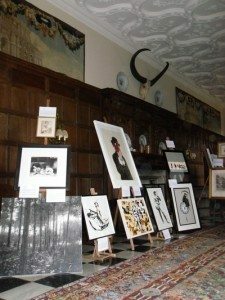 Hellen and I arrived at Chilham Castle at 10am to find the Exhibition was all set up by a local Art Gallery in the Main Hall. The Gallery consisted of paintings from various artists such as; Turner, Ric Horner, Emma Blackwood, Jonathan Stewardson, Damian Hirst, Alan Percy-Walker, Oliver Winconek and many others. Hellen and I were very impressed with the exhibition even though our combined art knowledge could fit onto the back of a postage stamp. Guests weren’t arriving until 2.30pm but we had lots to prepare before they arrived and were all keeping our fingers crossed that the rain would pass and the sun would come out. 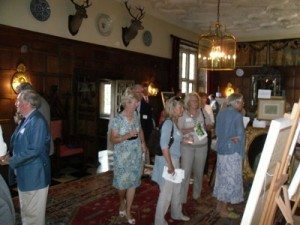 Guests all arrived promptly to a glass of Summer Pimms and a private viewing of the exhibition and a tour the Chilham Castle, which was spectacular and enjoyed by all. Guests were then welcomed into the gardens of the Castle with afternoon cream tea which consisted of a huge selection of cakes, scones, jams, whipped cream and strawberries and raspberries and tea and fruit juices. Many guests returned several times to taste the selection of different cakes we were serving. 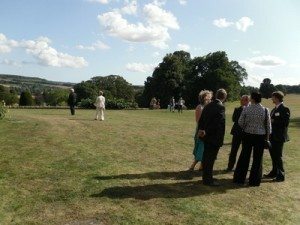 Although the weather had started off a little dismal in the morning the weather really picked up by the afternoon with beautiful sunshine so guests could enjoy the garden and marquee. Hellen and I were very pleased with how the day went and were both very tired by the end of a hard days work. Please contact Team Tactics if you are interested in a bespoke event for your staff or clients and we will be more than happy to help you with your event.